Argh! It’s down to the crunch, in terms of school and all that. So very many things to do.. 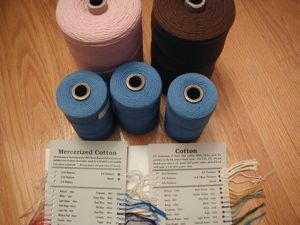 I received my package from Camilla Valley Farm – two cones of 8/8 cotton, 1 pound of 4/8 mercerized cotton. Unfortunately, the brown isn’t what I was hoping for so I’m going to return it for another colour (and I got the shade cards, so now I can actually see the colours!). 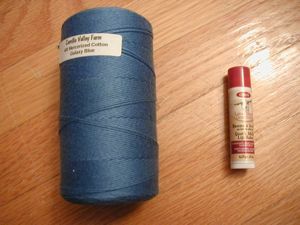 A 1/3 lb cone of mercerized cotton next to my standard-size organic goat’s milk lip balm. Tiny, eh? I wasn’t expecting that, but so long as the yardage is correct, it’s a-ok! See the needle there? Yeah, I’d started making the heel. Hrmph. Anyway, I ripped it back, and did a heel based on the pattern “Priscilla’s Dream Socks” but it kind of looked like crap. 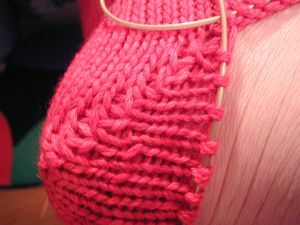 Although I’m surprised that my camera even managed to capture such a close view, it doesn’t really show how the heel looked – the yos created really loose stitches. 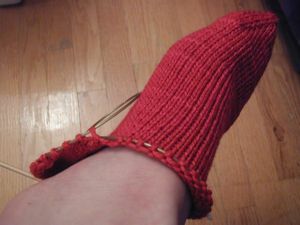 So I ripped again, and did a short-row heel with wraps – it looks much better. So now I can finally get moving on the rest of the sock.